Following the 2016 election, Philippa Hughes realized she didn’t know a single Trump voter and set out to change that by hosting small bipartisan dinner parties – “Blueberries and Cherries” – at her home. This in part led to the creation of “A (GOOD) AMERICAN,” an art show sponsored by American University School of Public Affairs and The Pink Line Project that examines the immigrant experience and celebrates what it means to be an American. For Sanity’s first live episode, we traveled to Washington D.C. to help kick off a 50-person bipartisan dinner party celebrating the art exhibit at the Heurich House Museum with the show’s brainchild. It’s Tuesday night and Philippa Hughes is putting together the finishing touches on dinner. The smell of chicken baking in a cast iron pan floats through the air as water and coconut milk boil on the stove. Hughes is hosting a dinner party for strangers to talk politics over pasta. It’s an idea that could very easily get messy, and maybe that’s only appropriate for an idea borne from a messy presidential election. An hour before her dinner guests were set to arrive, Philippa Hughes was surprisingly prepared. “The entire menu tonight is red and blue themed,” the 48-year-old art curator said giddily as she laid out a platter of blue corn chips, red grapes and blue cheese. Her colorful apartment in the U Street neighborhood of Washington, D.C. was filled with the smell of roast beef; a pot of linguine simmered on the stovetop. "She is a liberal and didn't vote for Trump, but she approached the dinners with no agenda beyond getting everyone a little closer to understanding where the other side is coming from." 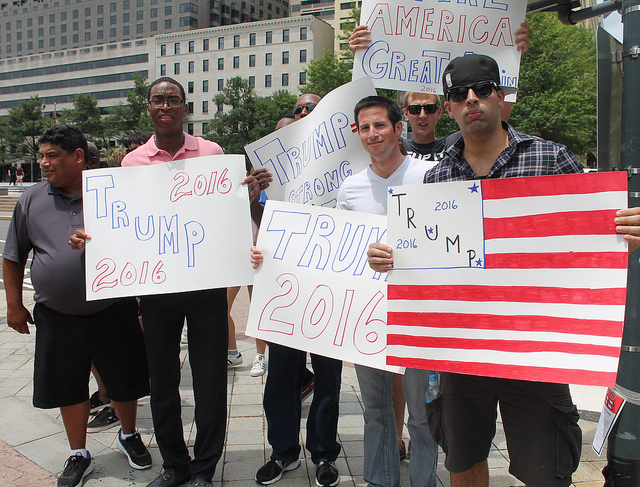 What’s It Like To Be A Trump Supporter In D.C.? "Jeff Giesea says he isn’t what most people expect a Trump supporter to be – he’s a gay, Stanford-educated resident of a city Hillary Clinton carried by over 90 percent. But Giesea says broad stereotypes are part of the problem with modern politics, where common ground is often hard to find." Philippa joins the show at 22:14 and invites Jeff to dinner! "Like many Washingtonians wondering "WTF now?" Hughes is trying to figure out what to do in the wake of Donald Trump's surprise victory."